The Mane Objective: Take The Pledge: Support #NaturalHair Small Business!!! 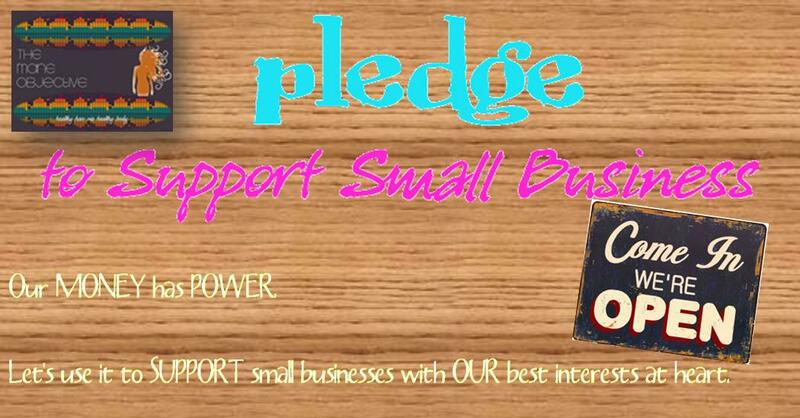 Take The Pledge: Support #NaturalHair Small Business!!! In the coming days, I will be featuring an article here and on BGLH that is all about supporting natural hair small businesses. Be on the lookout for that! But in the meantime, you all can join me in the effort to support small business. Starting today, I am pledging to support at least one natural hair small business per month. That may seem like a lot of money, but when I put it into context, it really isn't. My budget is roughly $20 a month for this pledge, so for me that means skipping out on buying lunch or dinner twice a month. That's really not a big deal -- I need to cook more anyway. Alternatively, I could just take one less trip to Sally's a month. Either way it goes, it is more doable than thought. Even if you can't commit to one purchase a month, agree to do whatever you can. Maybe every other month, maybe every 3-4 months. Even if you can only do it once, period. Just do it! The natural hair community is about empowering eachother to embrace the hair God gave us. Why not do so economically, as well? I'm committed to supporting these hard-working women and men. Not only because they are Black, but because they get it. They understand natural hair needs. They understand that we don't like certain ingredients in our products. They understand the value of quality over quantity. So join me! You can join the pledge by commenting on THIS post, on the Instagram Pledge, or Facebook Pledge! There will be a YouTube pledge coming soon. Join today, and let me know which small business you'll be supporting! This is such a good call. I try to only support small businesses. It's important for so many reasons--but especially as black women we have a lot of spending power. Always is a choice, and there are a lot of ladies making natural hair products and selling them online (I get a lot of mine from etsy.com and also Healing Herbs by Rene). You will eventually find something you like MORE than from large companies, and they often tell you EVERYTHING about EVERYTHING in your products! Small business is the way to go. I am so happy to read about this! I pledge to support small businesses, especially Oyin Handmade! Hi NaTyshca! Just e-mail me at info@maneobjective.com!